One of the most striking birds in the world has bred at Paignton Zoo. 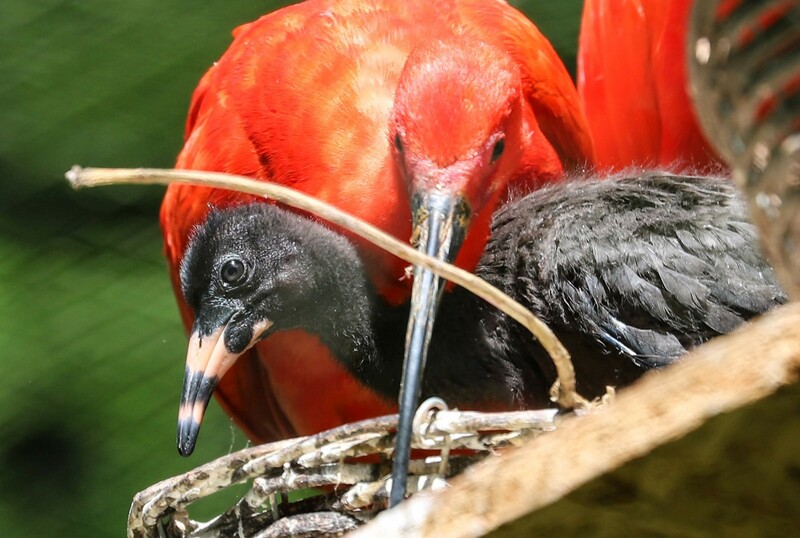 The scarlet ibis (Eudocimus ruber) is famous for its bright red feathers and curling beak. Paignton Zoo has a flock of 15 scarlet ibis. The species comes from South America and the Caribbean; its International Union for the Conservation of Nature status is Least Concern, although some local populations are thought to be declining. To attract a female, the male will perform a variety of mating rituals such as preening, shaking and head rubbing. Pairs then build platforms in trees using sticks. The female lays a clutch of three to five eggs which incubate for around 19 to 23 days. After a successful courtship, pairs remain together, sharing parental responsibilities for the young. In the wild they probe soft mud looking for food with their long, thin bills. Shrimp and other red shellfish help produce the birds’ red colouring; Paignton Zoo keepers feed them pellets with the ingredients to maintain their stunning plumage. This is one of the two national birds of Trinidad and Tobago. Paignton Zoo Environmental Park is a registered charity. For more information go to www.paigntonzoo.org.uk or ring 01803 697500.